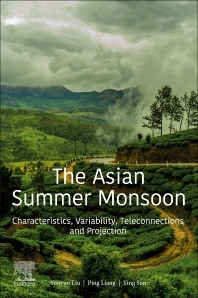 The Asian Summer Monsoon: Characteristics, Variability, Teleconnections and Projection focuses on the connections between the Indian Summer and East Asian Summer Monsoons, also including the South China Sea Summer Monsoon. While these systems have profound differences, their interactions have significant impacts on the climatic regimes in the region and throughout the world. In summer, the ASM engine pumps moisture transported across thousands of miles from the Indian and Pacific Oceans to the monsoon regions, producing heavy rains over south and east Asia and its adjacent marginal seas. This book reviews the different subsystems and their impact, providing guidance to enhance prediction models. Dr. Yunyun Liu (刘芸芸), works in the National Climate Center of the China Meteorological Administration (CMA). She received her Ph.D in atmospheric science from Graduated School, Chinese Academy of Sciences in 2009. She worked in Climate Prediction Center (CPC), National Oceanic and Atmospheric Administration (NOAA) in the US in 2013, examining the skill of the state-of-the-art climate models in simulating the interannual variability of the East Asian monsoon precipitation. Dr. Liu’s work focuses on the atmospheric general circulation, mechanism of climate variability and interaction of the Asian summer monsoon subsystems and their influence on East Asian summer rainfall anomalies. Her research has been funded by grants from the Natural Science Foundation of China (NSFC) and Laboratory for Climate Studies, CMA. She also is involved in NFSC Project, the National Basic Research Program of China, and CMA R&D Special Fund for Public Welfare, related to the Asian monsoon system variability and predictability. She was appointed as a member of the creative team for short-term climate prediction in CMA in 2012. She has published more than 30 peer-reviewed journal articles and has contributed to numerous books. Dr. Ping Liang (梁萍), works in the Shanghai Climate Center, CMA. She received her Ph.D from the College of Atmospheric Science, Nanjing University of Information Science & Technology (NUIST) in 2010. Dr. Liang has worked in several countries since 2007. As a visiting scholar, she worked in Coastal Fluid Dynamics Laboratory, NC State University, USA and examined regional climate modelling in 2007. She visited the Centre for Australian Weather and Climate Research, The Australian Government Bureau of Meteorology and did acollaborative study in Asian-Australia monsoon climate change by use of IPCC AR4 model simulations in 2011. Recently, she visited McGill University, Canada in 2016 and studied sub-seasonal prediction over East Asia during boreal summer using the Canada monthly forecasting system. Dr. Liang’s work focuses on multi-scale variability diagnosis and climate prediction of the East Asian summer monsoon, and she has published more than 30 peer-reviewed journal articles and has contributed to numerous books. Dr. Ying Sun (孙颖), works in the National Climate Center, CMA. She received her Ph.D in atmosphere sciences from Chinese Academy of Meteorological Sciences in 2002. In 2004, as a recipient of the National Research Council Resident Research Associateship in the United States, she went to NOAA and served as a Post-Doctoral research associate. Dr Sun’s expertise is on detection and attribution of climate change, future projection of climate change in East Asia, and the past and future changes of climate extremes and their impacts on the severe disasters in China. She has worked on the studies of climate extremes and precipitation in East Asia and the globe for the past and in the future. Dr. Sun has published more than 50 peer-reviewed papers. During the past 10 years, Dr. Sun has lead and participated in multiple projects and programs, such as the Chinese National Natural Science Foundation Youth Project, the State Key Programs, and the National Key Basic Research Development Planning Projects, etc. She also served as a chapter author of the National Assessment Report on Climate Change in China and some national reports. She has been and will continue to be actively involved in many scientific activities in CMA.